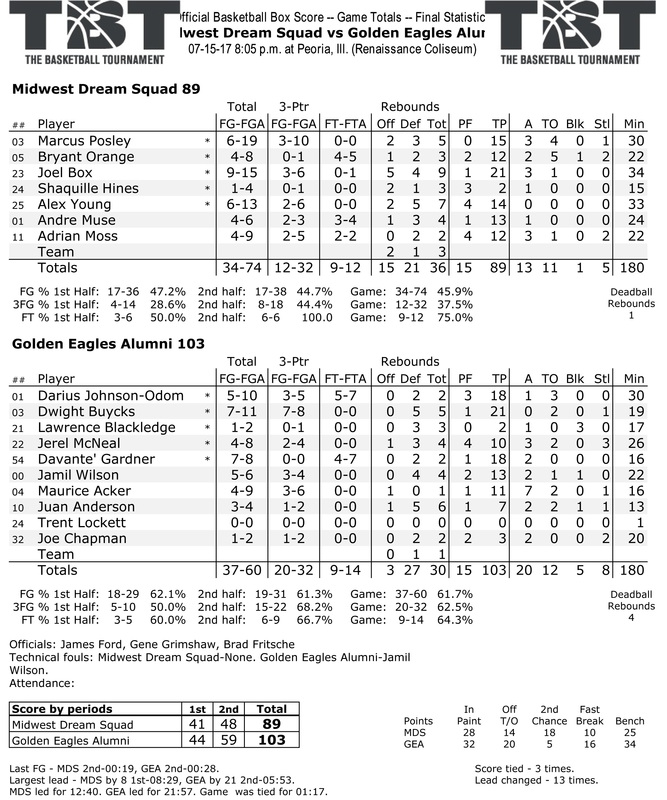 Dwight Buycks connected on seven of his eight attempts from beyond the three-point line and finished with a team-high 21 points in just 19 minutes as the #1 seed Golden Eagles ran away from #16 Midwest Dream Squad in the second half to advance with a 103-89 victory. Darius Johnson-Odom (18 points), Davante’ Gardner (18 points), Jamil Wilson (13 points), Maurice Acker (11 points) and Jerel McNeal (10 points) all reached double figures for the Golden Eagles, who shot 63% (20-for-32) from beyond the arc. Joel Box hit nine of his 15 shots and finished with a team-high 21 points for the Midwest Dream Squad, which lost in the opening round for the second straight year after falling on a last-second buzzer-beater to the Fighting Alumni in the Super 17 in 2015.